BRISTOL SHOW 2011: Chord Company rolls out anti-vibration plug across interconnect range | What Hi-Fi? Based on the hand-turned acrylic plugs used on the company's high-end Sarum, Signature and Indigo interconnects, the new Chord VEE (Vibration Eliminating Enclosure) plug is high-pressure precision injection-moulded from ABS plastic, which the company says has been 'chosen for its excellent vibration damping properties'. The new plug is standard across the company's interconnect range, being fitted to CrimsonPlus, CobraPlus, ChameleonPlus, Chorus 2 and Cadenza, the iChord models for portable player connections, and the Codac Digital and Prodac Pro Digital electrical digital interconnects. 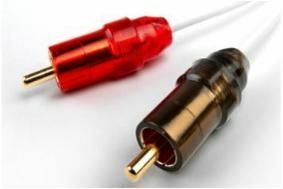 The plugs also use silver- or gold-plated low-mass connectors insulated with Teflon, and the cables are hand-assembled using a non-compression strain relief system designed to maintain constant impedance along the cable's length. Chord says that its Technical Director Nigel Finn 'has been working for a long time to develop and fine tune a plug that brings such demonstrable improvements.